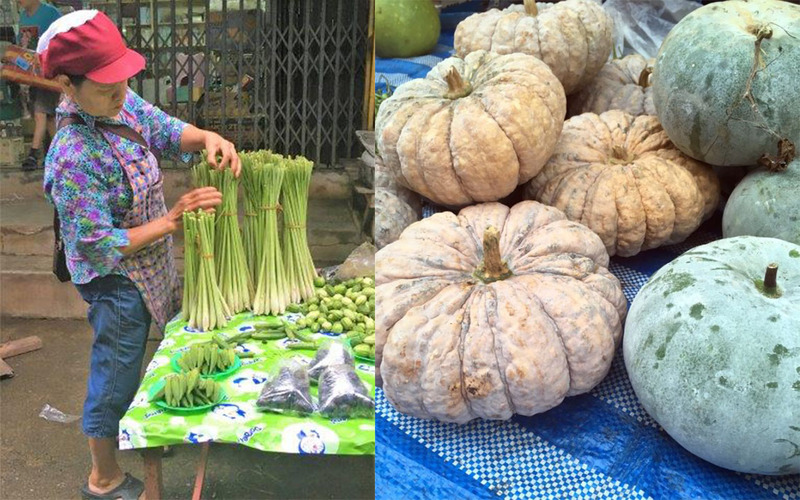 Travel writer Caroline Gladstone has been to dozens of Asian and European markets over the years, and shares her early-morning experience at the Nan markets in northern Thailand. Thai morning markets have a special quality. That’s because locals and visitors can make offerings to the Buddhist monks and their young novices, who stroll about the area just after dawn. The ritual is known as giving alms, or tak bat in Thai. Our group of Aussie travellers was up and out of our hotel by 6am, in readiness for the Nan morning market, which was already bustling at this early hour. On arrival our guide gave us some quick instructions on what to do when the monks arrived. 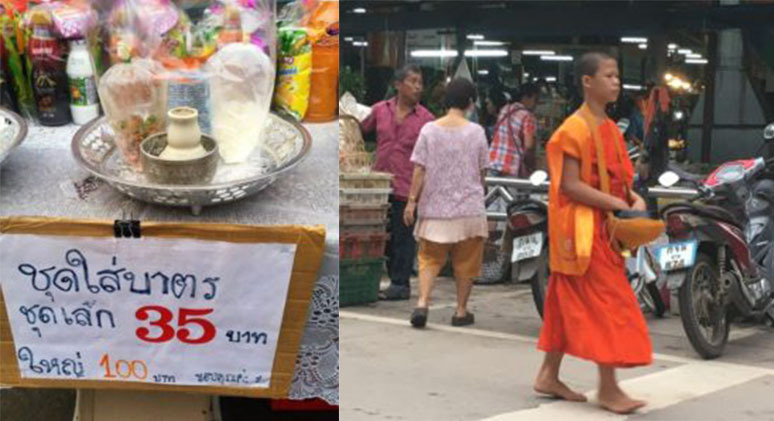 She handed each of us a pre-packaged offering – a small bungle of goods consisting of sticky rice, water and sweet snacks – purchased from a nearby vendor (at 35 baht each or about $1.50) to give to a monk as he walked past, in exchange for a blessing. We lined up waiting and before we knew it the monks seemed to appear from nowhere. As the monks stopped in front of us, we knelt down and handed our gift up. The monks then placed the gifts in a large steel bowl each of them were carrying in a cloth bag worn over their shoulder. Once his bowl is full, the monks return to the temple where the food is shared among the congregation. Each monk is allowed two small meals a day (which can include meat), and what’s not eaten by the monks is distributed to the poor. If there’s anything left over, it’s given to the cats and dogs that hang about the monastery. Some ceremonies have become quite the tourist spectacle I’ve read, where tourists jostle for the best photos and create a level of chaos out of keeping with the spirit of the occasion. But here in regional Nan, away from the madding crowd, it’s still a peaceful process. Nan markets are fascinating – the best I’ve visited in many years. I think that’s because they are small (with not much chance to get lost) and the food looked fresh and inviting. Although relatively busy, the stall holders weren’t too pre-occupied with customers and had time to nod and smile at us. 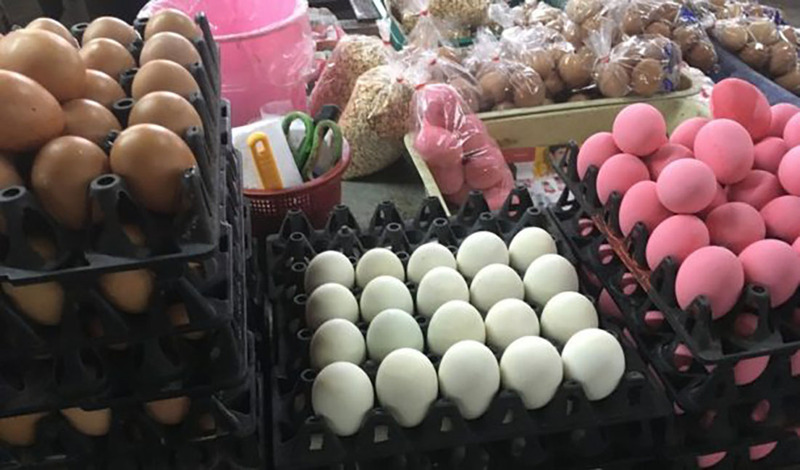 I was fascinated by the pink coloured eggs – perhaps they were for kids – and loved the little coconut milk ‘hotcakes’ that one trader was making over a hot griddle. Other items I spied weren’t so cute – a bucket of wriggling snakes and another full of tiny turtles swimming desperately about in the confined space. I wondered about their fate – and of course, speculated as to who was going to buy the snakes and what for?! It’s certainly worth sacrificing a bit of sleep and getting up early to hit the markets – there’s a buzz in the streets, the monks make for a fascinating sight and there’s always a sweet treat on offer. And who doesn’t like their day to begin with a blessing. Getting there: The best way to get to Nan is to fly. It’s just over an hour from Bangkok’s Don Mueang Airport. Nok Air fly five times a day; Air Asia flies twice a day. There are also two flights a week from Chiang Mai airport on Kan Air, taking approximately 45 minutes. Read Caroline’s full story on her travel blog Caroline’s Cabin Fever.